A programming example is being provided to our visitors free. They will help you in preparing the resume you will be satisfied with and use, hopefully to land the position you are looking for. These examples are a guide, to make it easy for our visitors to just backspace and re-fill the information. Then you can the choose between which formats that you actually prefer to use. Experiment by modifying the style and the format if you wish, to fulfill your own criteria. 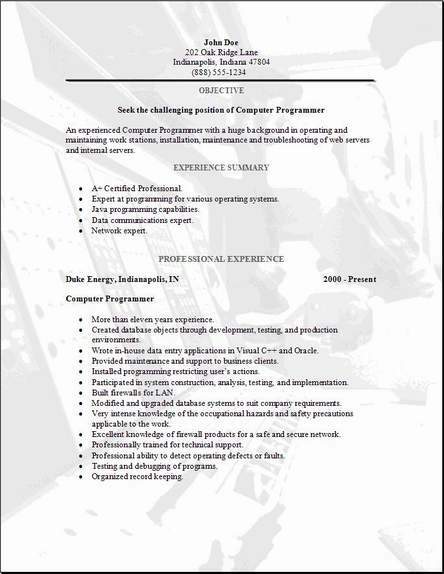 You can get a good idea on what to add to your programming resume below. Provides programming, user support, and training for all company systems. Maintains and modifies as required the software applications for system advancements. Generates queries and reports to support the user community. Performs data and financial analysis as required. Works with multiple hardware and software platforms of a complex nature. Produce, modify, and debug computer programs to allow the production facility to achieve the highest level of output possible. Analyzes software products recommending new products and services, which would increase overall plant production. Perform diagnostics, troubleshooting and testing for software. Serve as member of a team or a various project group in area of expertise once a month as assigned by IT manager. Maintain and update your level of technical expertise yearly. Interact and cooperate with other IT professionals. 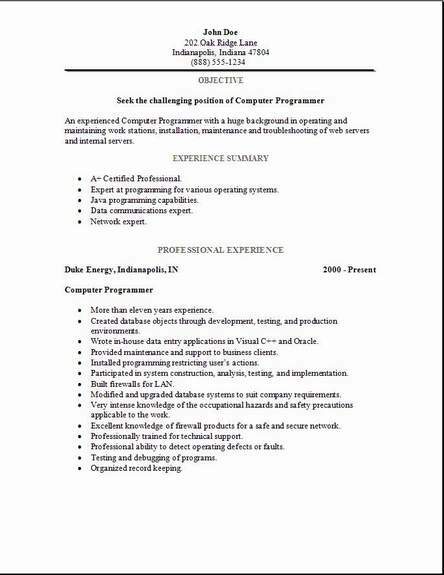 The programming resume template you find above is a very recent addition and I trust you will find the options of downloading the 3 most used formatted resumes a huge relief during your resume search. Chronological is always most chosen as the best resume, I know that I agree with that assumption myself. 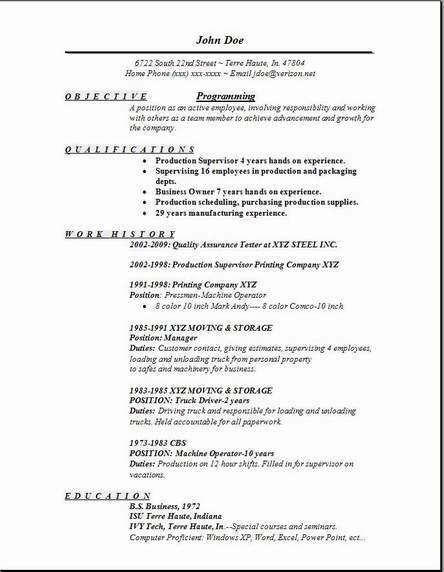 We continue to provide our visitors with the best and the easiest options for downloading word, easy to edit resumes. Enjoy!